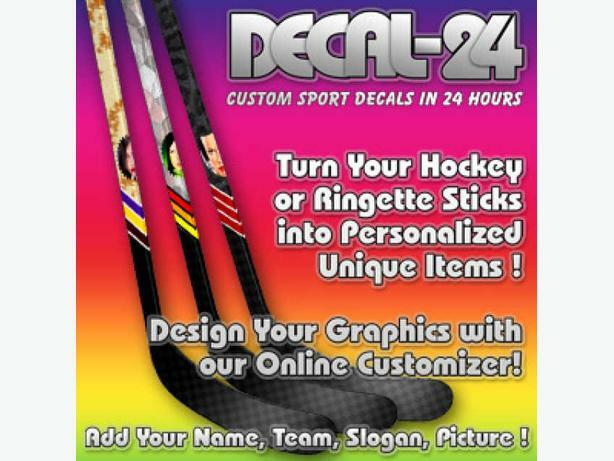 Dress up your hockey or ringette sticks with unique personalized wrap around graphics decals. Custom design in custom size. We ship the ordered decals in 24/48 hours. We've created an online application for you to design your own decals/stickers. Pick from standard sizes for hockey player and goalie sticks, ringette sticks and mini sticks, or set custom dimensions. - Unique Real-time instant 3D-View ! - Cannot Find Your Favourite Kicker? Upload Yours ! - ~Unlimited Design Variations Give You the Real Freedom ! - You can Select from our Pre-Defined Decal Design Templates or Design Your Own Decals. - Choose from 50+ Mask Images to Easily Change on the Base Design ! - Separated Chevrons for the Top and Bottom Parts. 0-3 Chevrons per Ends in any colors. - Save Your Designs, and You will be able to Use them in the Future ! for player sticks we ship 1 wrap-around decal (covers the shaft on all the 4 sides), and for goalie sticks we ship 3 decals 1 wrap-around decal for the shaft, and 2 decals for the paddles. apply your decals in less than 10 minutes! Step-by-step instructions on the website. beside our great prices, we are offering group (4+), team (10+), and association (50+) discounts!